Known as the Weeping Philosopher, Heraclitus of Ephesus was a self-taught sage and a depressive misanthrope. He hated the mankind and grieved at the folly of all men. He was known to lead a secluded life and fed on grasses. In China, there was a learned and ascetic intellectual called Lao Tzu. Having witnessed the morally corrupt life in the imperial court, Lao Tzu grew weary and disillusioned, and subsequently commenced a life as a hermit. Heraclitus talked about the unity of opposites: a universe of constant change (you can never step twice into the same ever-flowing stream) yet with the same underlying law. Lao Tzu talked about the constant interaction of Yin and Yang, an emphasis on universal oneness and its opposing manifestations in duality (male and female, summer and winter). Heraclitus’s sayings were obscure and shrouded with incomprehensible riddles and paradoxes. Lao Tzu’s Tao Te Ching is a valuable text written vaguely in classical Chinese, with deeper meanings hidden underneath various analogies, rhymes and ancient sayings. A seemingly typical asphalt laneway linking Lonsdale and Little Bourke Streets, Heffernan Lane silently imparts classic words of wisdom to the daily pedestrians. Heffernan Lane is Melbourne’s very own path of philosophers, a narrow passageway adorned with wise sayings from the East and West, thanks to the creative installation of artist Evangelos Sakaris. 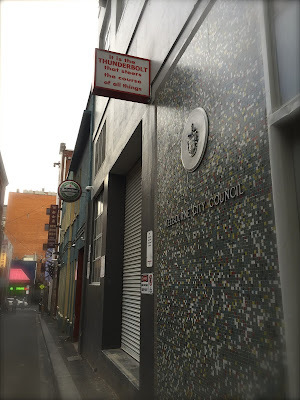 Unassuming signage bearing sacred texts of Heraclitus and Lao Tzu are tucked and scattered along the quiet laneway connecting the romantic Greek Precinct on the north and the bustling China Town on the south. Pedestrians treading the footpath are mentally challenged and spiritually invigorated. We are reminded of the value of the intangible and emptiness, for after all, it is the holes within that make a room useful. We are urged to remember the true “thunderbolt” that steers and in control of all things, to dwell on substance rather than on the deceiving surface of things. Unsolicited yet useful advice and golden rules in life are generously offered to patrons of Wing Cheong Asian grocery store, diners of casual Chinese culinary New Kum Den, happy pub-goers at Union Electric and other random passersby, if only they could decelerate their walking speed, pause and ponder, and be prepared to get lost in thought.